Most children love Dr.Seuss books, and my kids are no exception. While reading Green Eggs & Ham, my 5yr old asked if green eggs were real and I said I would make him some. I think these would have turned out nicer as scrambled eggs. They tasted GREAT, but I only made it into mini quiche because I already had the oven on. Scrambled would have been just as nice and the colour would have been brighter. -Chop and carmelize 1 onion and a few cloves of garlic until soft and brown. I used coconut oil, but any oil or butter will do. -Add 4 cups of loose baby spinach and keep covered on the heat until the leaves wilt and become dark green. No liquid is needed, the spinach will weep out moisture during the heating process. I used parchment paper muffin cups (they don't stick to ANYTHING), and filled each paper half way with the egg mixture. 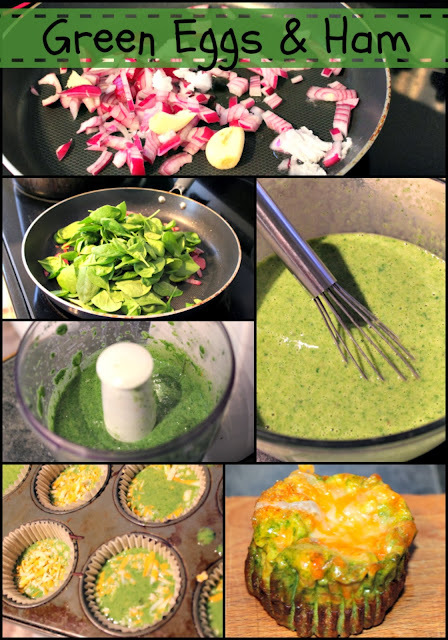 I then added a pinch of shredded cheese and continued to fill muffin cup to the 3/4 mark. The eggs will expand while baking and look like a giant cupcake or muffin while hot, but will quickly shrink back down once out of the oven. Bake for 20 minutes, and if you're a carnivore - serve with a nice slice of ham. So... what did the kids think? With the exception of my egg-hater, they all LOVED it. My 5yr old said it was just like the book: he didn't think he would like green eggs, but as soon as he tasted them he loved them and would eat them... in a box, with a fox, in a house, with a mouse, etc. Do you have a creative way you like to add veggies to meals? Share with me in the comments box or send an email and I will share with The Good Kind of Crazy readers. Happy Baking!